With an expressive wine from each of our five wineries tucked inside a custom wood box, this stunning five-bottle gift allows you a taste of everything we do, from the heart of Napa Valley to the cooler, coastal climes of Russian River Valley. 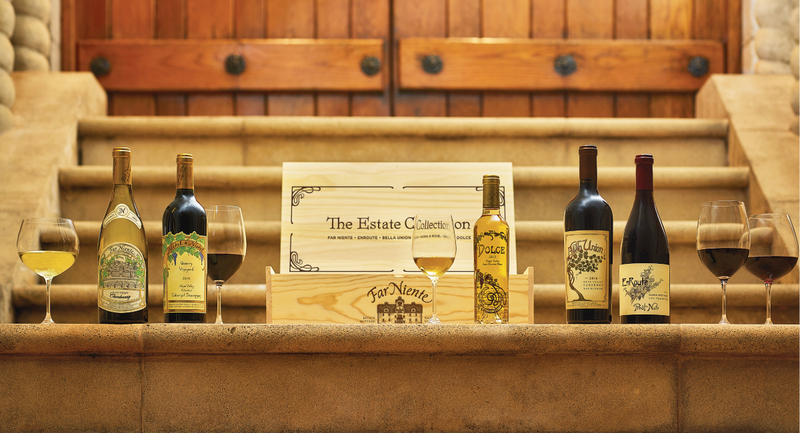 It’s an exquisite collection from our Far Niente Family of Wineries, and is available exclusively from us. Move over wine gift baskets, and make room for the wine gift box! 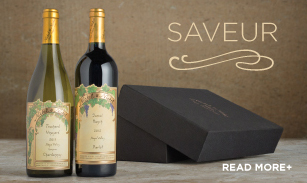 Give the gift of Napa Valley Wines. Comprised of wines from Far Niente and our sister wineries, Dolce, Nickel & Nickel and EnRoute from the Russian River Valley, the Estate Collection offers wine lovers an exquisite taste from four of our sister wineries. This elegantly boxed four-bottle collection is one of our most versatile gifts. Since our first vintage in 1979, we’ve remained focused on our mission of elegant Napa Valley Chardonnays with bright fruit flavors, lively acidity. layers of creamy texture and a long, mouth-filling finish. Delightfully fruit forward in youth, our Far Niente Estate Bottled Chardonnay evolves beautifully over time and can be enjoyed for five-to-ten years after the vintage date. This single-vineyard, 100-percent Napa Valley Cabernet Sauvignon from Nickel & Nickel is a stunning expression of the vineyard and region in which it was grown. Since 1997, Nickel & Nickel has dedicated itself to producing Single-Vineyard Cabernet Sauvignon from the Napa Valley’s most extraordinary AVA’s. Our EnRoute Pinot Noir, Russian River Valley, “Les Pommiers” is the consummate blend of fruit from our most remarkable Russian River Valley vineyards. The culmination of a more than 30-year passion for Pinot Noir, EnRoute was established in 2007 and has since gardnered a reputation for growing and making extraordinary Russian River wines. Inspired by the great late harvest wines of Sauternes, Dolce is the only winery in North America devoted exclusively to producing a single, late harvest wine each vintage. Aged for up to three years in 100-percent French oak, a bottle of Napa Valley Late Harvest wine marries luxurious stone fruit and caramel flavors with bright, refreshing acidity. 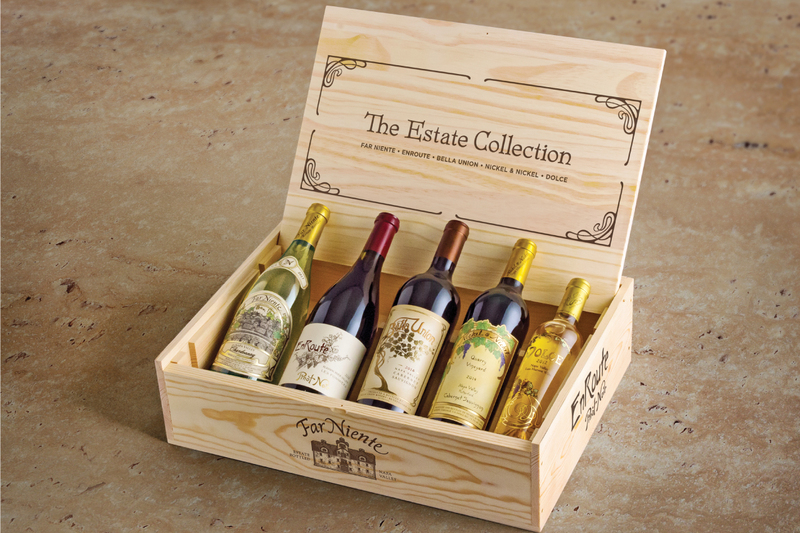 One of our most popular wine gifts, it adds the sweetest touch to this four-bottle boxed set.